Unparalleled references for any auricular acupuncturist seeking better clinical outcomes! Auricular Medicine and Auricular Therapy: A Practical Approach. 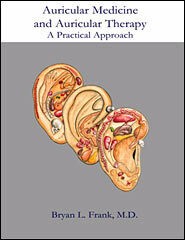 This is the most comprehensive text on both Auricular Therapy and Auricular Medicine written in over twenty years. This FULL COLOR Edition is soft-back, 8.5"x 11", 292 pages, 102 illustrations, references, index. Only $79.95+S&H*.